The racial climate in the country is teetering on extreme hostility and apparently Hollywood is not able to escape the inevitable backlash. 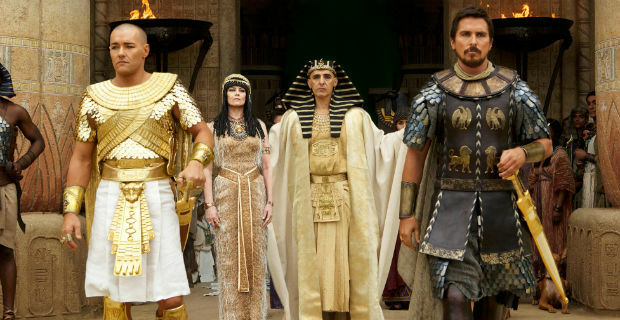 There has been a recent roll out of films seeped in biblical fare, Noah and Son of God each had their turn to shine earlier this year, and now Exodus: Gods and Kings is preparing for it’s debut in December. But despite the heightened anticipation, there is a growing sentiment that the film directed by Ridley Scott and starring Christian Bale (Moses), Aaron Paul (Joshua), Sigourney Weaver (Ramses’ mother) and Joel Edgerton (Ramses the Great), is purposely filled to the brim with mostly white actors, especially in the lead roles. As always the online community has already constructed their line of attack by accusing Scott as well as the film producers of what they describe as “cinematic colonialism”. The outrage stems from the outrageousness of casting directors who have always had an affinity for utilizing white actors for roles that historically don’t share their racial makeup. Exodus centers on the tale of an Egyptian prince turned prophet, Moses, who delivers the Hebrews to the Promised Land, and the supporting characters that help to enrich his spiritual journey. The consensus is that once again white actors are embodying roles that should be assigned to people of African descent, in order to accurately depict the historical qualities of the story. Joel Edgerton, one of the stars of the film, has vocally expressed his empathy, as the scathing criticism gathers steam with a newly initiated hashtag #boycottexodusmovie. Edgerton tackled the controversial subject of the boycott while attending the Melbourne International Film Festival by acknowledging the sensitivity of the issue and the validity of the crusaders. But he also explained that as a working actor he felt the responsibility to accept the role he was offered. “It’s not my job to make decisions…I got asked to do a job, and it would have been very hard to say no to that job”. Be that as it may, it is a known fact that Hollywood’s casting system has never been favorable to people of color. Since the days of Cecil B. DeMille’s epic feature, The Ten Commandments, that showcased Charlton Heston and Yul Brynner as Moses and Ramses, respectively, to present times, white actors have always been the favored choices regardless of ethnic barriers. Exodus: Gods and Kings is scheduled to land in theaters on Dec.12. Whether the viral uproar will have any effect on its reception is hard to gauge, but its pretty safe to assume that it will turn in good numbers at the box office, mainly because of the star power of leading man Christian Bale. But then again, there is strength in numbers, and if enough people hop on the train, there is no telling where it will end up.